We ride the new Royal Enfield Interceptor 650 on Indian roads, over potholes, speedbreakers and in hot and humid conditions in sweltering Goa. A 650 cc, parallel-twin engine modern classic motorcycle at ₹ 2.5 lakh (ex-showroom)! Yes, that's how much the new Royal Enfield Interceptor 650 costs. When we rode the new 650 Twins in California earlier this year, we were impressed with the refinement of the engine, the ride quality, and the handling the newest Royal Enfield motorcycles offered. But then, the real test would be in home conditions, in hot and muggy weather, tackling traffic, as well as our pothole-infested local roads. And that's precisely what we were doing for two days during the launch of the new Royal Enfield 650 Twins in Goa. And we're happy to report that we're left hunting for negatives to talk about. This is the most impressive bit about the new Royal Enfield Interceptor 650. It's powered by an all-new, air-cooled, single overhead cam (SOHC) 648 cc, parallel-twin engine, and it puts out modest figures - 47 bhp at 7,250 rpm and 52 Nm of peak torque at 5,250 rpm. But there's no pronounced thump like the Royal Enfield singles; instead the 270-degree firing order puts out a nice and soft burbling exhaust note from the slightly upswept twin exhausts. I love the sound, it's not too loud to create a racket, and you can hear the soft, bassy burble when you are riding within the city, cruising down a highway and when downshifting to overtake slow-moving traffic. 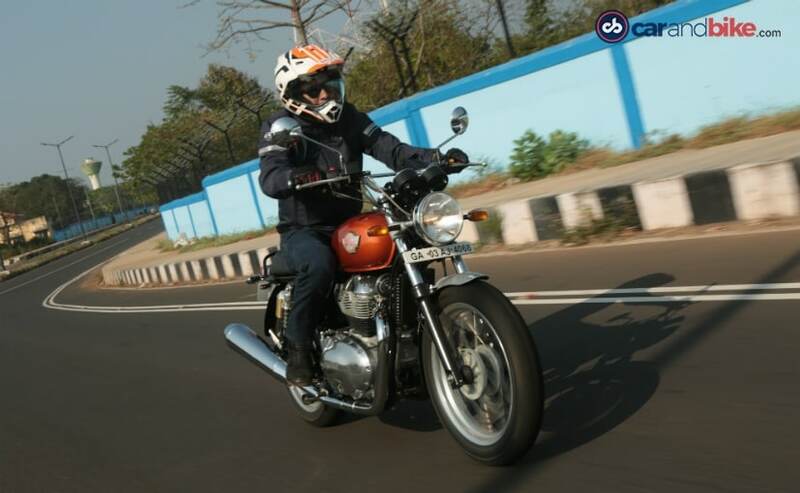 The throttle response is spot on; there's no off-on jerky throttle, the kind you'd experience on bigger parallel-twin engines, or even Royal Enfield's very own Classic 500. 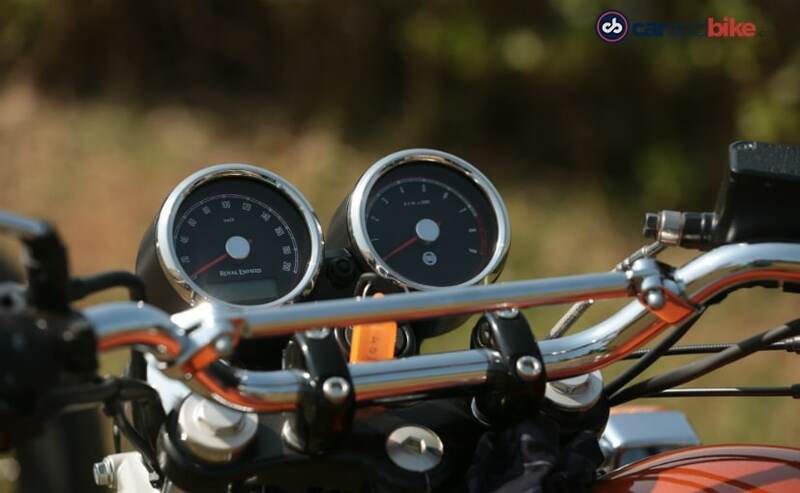 And that's because it's not just a bolted on Bosch fuel-injection system, but Royal Enfield engineers have tuned, tested and re-tuned the fuelling to make it smooth and accessible, even for riders with less experience of big engines. And yes, it delivers! The engine lays down the torque from low revs, so there's ample pulling power in a nice and smooth fashion. And four valves per cylinder means it's smooth and refined, across the revs, right up to the redline. You can feel some minor buzz upwards of 5,000 rpm, but mind you, these aren't like the vibrations that you would normally associate with any Royal Enfield single. So, no, this thing doesn't vibrate! It's silky smooth in operation and that is very impressive indeed! We first rode the bikes in California where temperatures were cool, and there was no discernible heat from the oil-cooled engine. And now, in Goa, where mid-day temperatures hovered around 35 degrees Celsius, even after more than a hundred kilometres of hard riding, there was no bothersome engine heat, despite the absence of liquid cooling. It's a big, air-cooled engine, so the cases do get hot, but there's no sense of heat toasting your legs. I was wearing riding denims and not once did I feel the engine heat bothering the inside of my legs. 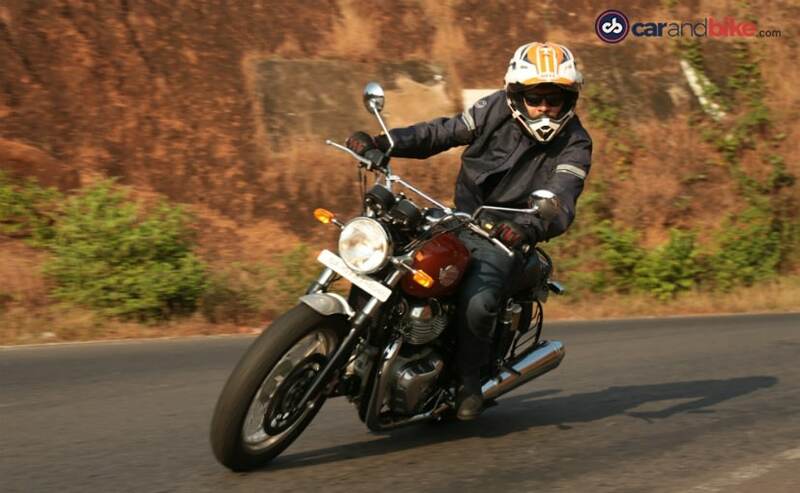 The six-speed transmission is a first for any Royal Enfield, and it's a slick unit. So, not once did we encounter any false neutrals, and clutchless upshifts are a breeze. The Interceptor 650 also gets a slipper clutch, so the lever feel is light, and even when tackling near bumper to bumper traffic in Goa, there were no nasty surprises. The gears slot into place with precision, and the ratios have been well-selected, so you don't really need to work on that gearbox too much to get the bike pulling from low speeds. One hundred kilometres per hour comes in effortlessly, and you wouldn't realise you're going that fast unless you glance at the speedometer; the engine is still somewhere around 4,000 rpm with a relaxed burble coming out from the twin exhausts. You can cruise all day at 130 kmph, and the torquey engine just requires a small twist of the throttle to pull cleanly for overtakes on the highway, so you don't even need to downshift a lot for those highway overtakes. The wind blast at those speeds though will get to you, but there's no sense of strain or the engine feeling stressed out even after prolonged high speed riding. And no, after a few hours of hard riding, over demanding roads and fast highways, there are no rattles, no jarring noises, either from the body or from the engine. 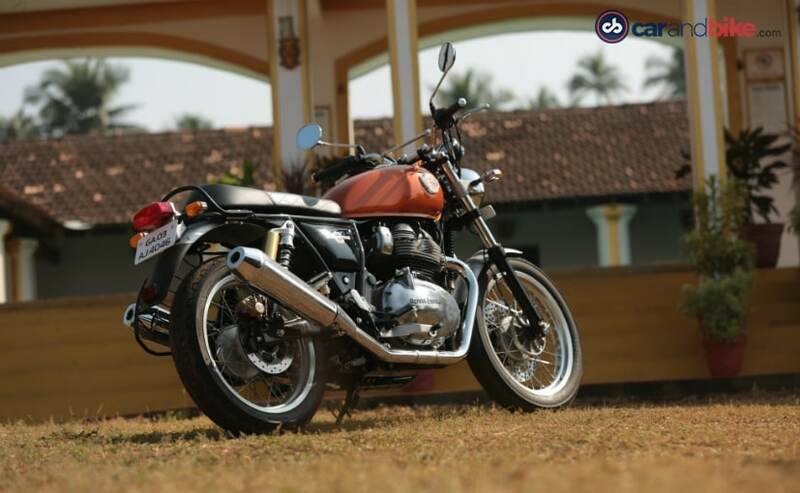 This is easily the best and most refined engine on any Royal Enfield ever! 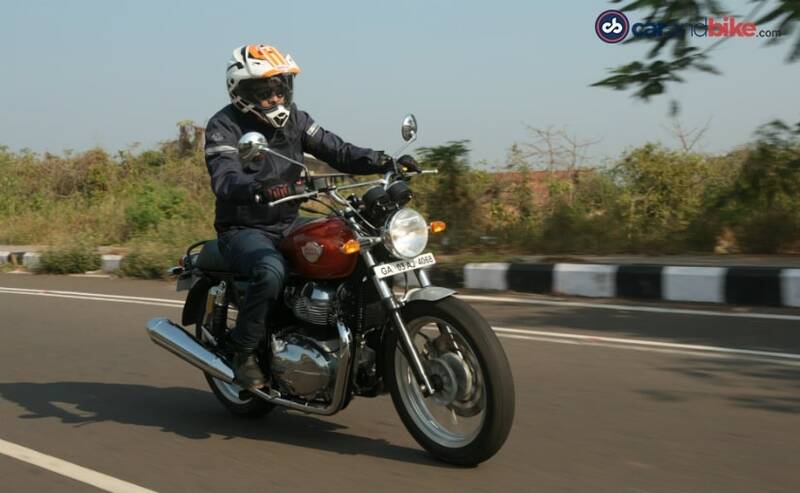 The Royal Enfield Interceptor 650 has good handling. Not sportbike sharp, but will not disappoint you with its road manners. The Interceptor 650 doesn't get too many expensive components, possibly to keep the price competitive, and very attractive. So, there's no top-spec suspension, no tubeless tyres and no fancy equipment, or electronics. The 18-inch spoked wheels are shod with Pirelli SportComp tyres which have been designed specifically for the 650 Twins, and these work well, providing very good grip, while leaned over around a fast corner, or even under hard braking. Two-piston ByBre calipers grip a 320 mm single floating disc on the front wheel and a 240 mm on the rear wheel. The dual-channel ABS works well, and provides sure-shot stopping power, although the rear brake could have done with some more bite. The ride quality is soft and cushy with the suspension at its softest setting. Better aftermarket suspension can make the Interceptor 650 even better. The Interceptor 650 we're riding in India has the rear shocks dialled down at the softest setting in the 5-step pre-load adjustment. The shocks provide decent damping and sailed over all kinds of challenges - potholes, broken roads and even speedbreakers which were despatched without the suspension crashing or bottoming out. The front suspension has 41 mm forks with 110 mm of travel, and with 174 mm of ground clearance, the Interceptor 650 can tackle all kinds of terrain. We even tried a fair bit of off-road riding to a location on top of a cliff, so yes, this one certainly can go places, even to the high Himalayas like Ladakh and Spiti. The only let-down in loose gravel is probably the street-oriented tyres, which are not really meant for tackling such terrain. 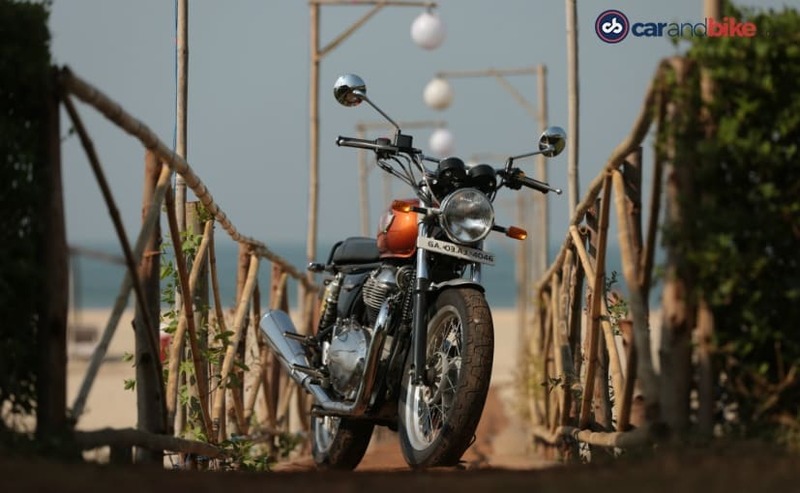 Nevertheless, die-hard Royal Enfield riders will be happy to know that the Interceptor 650 can take a whole lot of beating, without any loose nuts or bolts, or the suspension letting you down. 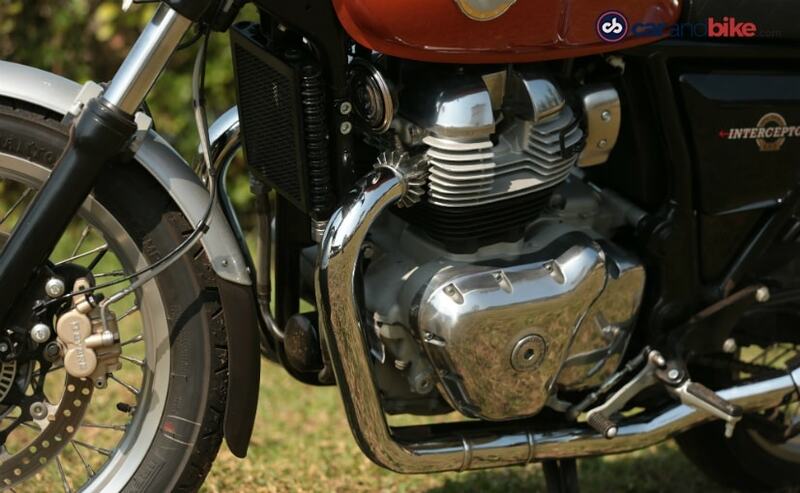 The Royal Enfield Interceptor's design is quintessentially modern classic. Clean lines, minimalistic lines and no flashy body panels. The standard version in the bright Orange Crush shade looks nice, with the period Royal Enfield monogrammed badge on the fuel tank. It's a well-proportioned motorcycle with simple looks, and comfortable ergonomics. The slightly upswept twin exhausts are finished in glossy chrome, as are the crank cases on the engine. The rims though get the brushed aluminium like treatment in matte silver, and the tall handlebar with a chrome cross bar harks back to the period design detail. For the more style-conscious riders, there are two more variants on offer, the Interceptor 650 Classic with dual-tone colours and the Interceptor 650 Chrome, all with the same engine and cycle parts. The only difference is cosmetic, in the colours and decals and these are available in a choice of six different treatments. Build quality, for the most part, is quite nice, and even after riding the motorcycles hard over a lot of broken surfaces, the Royal Enfield Interceptor 650 didn't feel flimsy or poorly built. The only negatives we could think after some nit-picking would be the absence of LED lighting and a more feature-rich instrument panel. A clock, gear position indicator and fuel consumption display would have certainly been helpful. And a standard hazard light switch could have delighted the touring-friendly crowd, especially when pulled over the shoulder on a lonely mountain road. But then, these are just minor cosmetic items on our wish-list and shouldn't be a deal-breaker in any way. 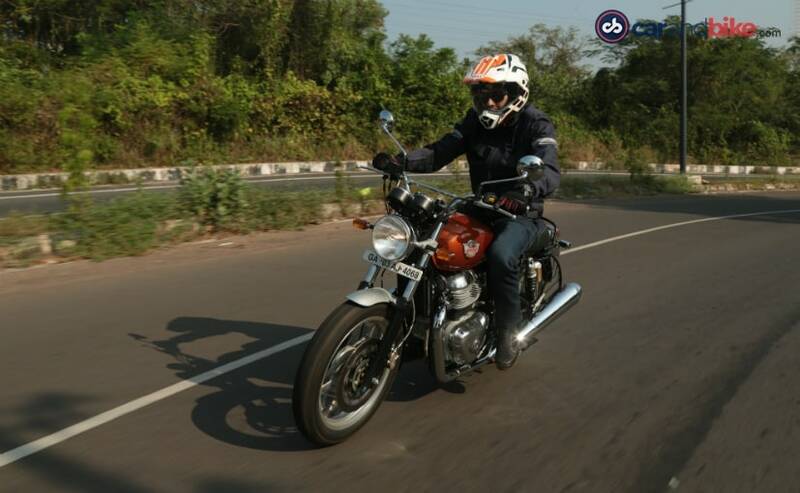 The Royal Enfield Interceptor 650 has little faults, and if not an out and out 'premium' motorcycle with high-tech electronics and features, it will blow you away with its simplicity, refined engine and silky smooth performance. 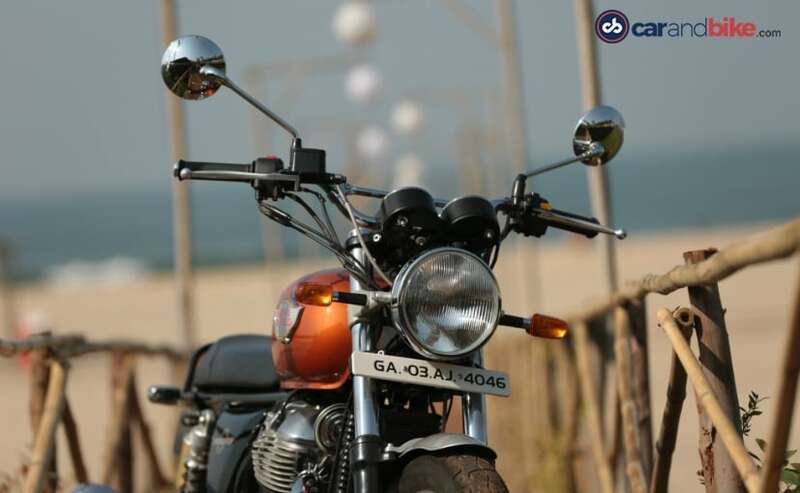 This is unlike any other Royal Enfield ever, and we suspect Royal Enfield's strategy of getting its existing pool of Classic 350 and Classic 500 owners to upgrade to a larger capacity, twin-cylinder engine is spot on. With prices starting at ₹ 2.5 lakh (ex-showroom) for the standard Interceptor 650, ₹ 2.57 lakh (ex-showroom) for the dual-tone Custom variant, and ₹ 2.7 lakh (ex-showroom) for the Chrome variant, the Interceptor 650 is fantastic value for money. And I suspect a lot of prospective Classic 500 customers may very well walk out of Royal Enfield dealerships with an Interceptor 650 instead. A short test ride is all it takes to make an impression, and we think this will certainly change the game, not just for Royal Enfield, but for motorcycling in India in general. At those prices, for a product as well-rounded and well-engineered as the Interceptor 650, motorcycling will never be the same again. 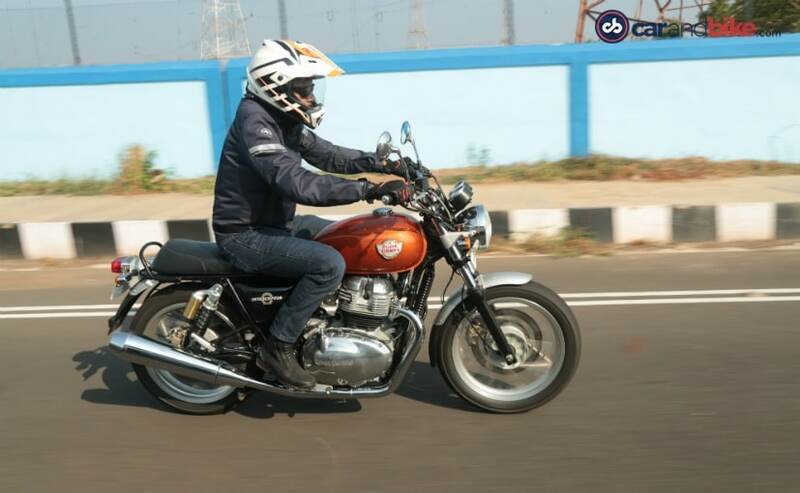 At ₹ 2.5 lakh (ex-showroom), the Royal Enfield Interceptor 650 is an irresistible package; the best Royal Enfield ever! And unlike any other twin-cylinder motorcycle available on sale right now, the Interceptor 650 will be easy to live with, easy to repair and is bound to have a lot less running costs - be it spares, service or even the occasional brake lever or rear view mirror replacement. 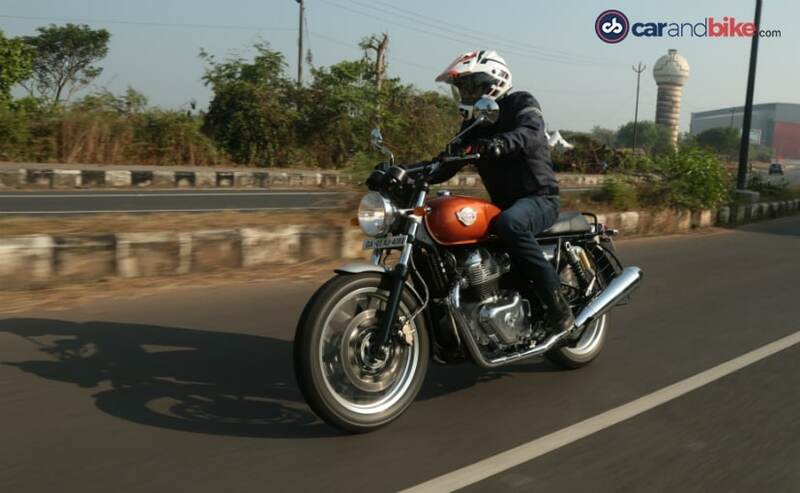 This is no sportbike though, and although it holds its own under spirited riding on a curvy road, the Royal Enfield Interceptor 650 is not meant to give you goosebumps or adrenaline pumping excitement. If that's your scene, you're better off looking elsewhere. The Royal Enfield Interceptor 650 is all about motorcycling in its simplest form - two wheels, a great engine and an absolute hoot to ride. Royal Enfield just dialled up its brand equity with the new 650 Twins, and the Interceptor 650 could very well make it the biggest mid-size player in the global motorcycle market. It's playtime folks, go get a test ride!